Rotameters, also known as variable area flowmeters, are designed to measure the flow of liquids or gases via a tapered tube and float system. They are accurate, reliable and simple to install and maintain. 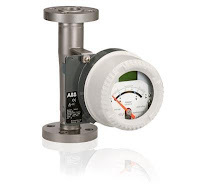 The biggest benefit is their low cost, which has made them a popular choice for many flow applications since Fischer & Porter introduced the first mass-produced glass tube flowmeter in 1937. TECO was the first firm to represent and sell the Fischer & Porter Rotameter Line, dating back to March, 1947. The following brochure is designed to help you select the right ABB rotameter for your application. You can read it below, or download your own copy of the ABB Rotameter brochure from this link. If you have questions or are ready for a quote, simply contact TECO at 800-528-8997 or visit teco-inc.com/ABB.